I will admit to having something of a strong like for golf shoes. I’m not a sneakerhead — one of those guys who buy pair after pair of basketball shoes — but I can kind of understand how it happens. I play a lot of golf. I walk almost every round I play. So my golf shoes are important to me. I want something that is comfortable, keeps me from slipping and provides enough support for my feet so that my slight case of what I think is probably plantar fasciitis. But I also want them to look good. There was a time when picking golf shoes was much easier. I’d get a new pair of Footjoy Dryjoys each spring and use the ones from the year before as my second pair.Since then, there are more and more good options out there. Now, do I really need a new pair of golf shoes? Of course not. I currently have three pairs of shoes in the regular rotation (though one pair is kind of on reserve). The two primary pairs are a pair of adidas Tour 360 3.0s in all black. The other is a pair of adidas Powerband 3.0 in all white with black stripes. The clear No. 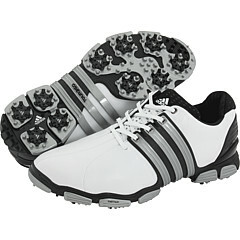 3 is a pair of white Footjoy Dryjoys with the Reelfit lacing system (the ones with the knob on the back). I thought I hit the shoe jackpot recently when I saw one model of Footjoy ICON’s on the sale table at Golf Galaxy. The ICONs are the replacement for the Classics and have a retail price in the $250 range. When I saw some pairs of black on black saddles for $129, I was thrilled. But then I tried them on. I generally grab my size in Footjoys and am good to go. But these 11s didn’t come close to fitting. They were tight on the top of the foot and it was very odd. The 11.5s were still not great in that area, plus they kind of slipped in the heel when I walked. What I want: I like how companies (adidas in particular) has produced shoes that are updated versions of classic shoes. They look good with pants, but also look good with shorts. Basically I want something that still looks stylish with shorts. That means that both FJ ICONs and the new DryJoy Tours are probably out. I’m not going to spend the money for the ICONs at this point and while the DryJoy Tours have a nice classic look, I think I’m going to go with something more stylish. Because I’m good with black and white shoes, I’m leaning toward some version of a saddle shoe that will look good with shorts. Pros: This is probably the safest choice considering I had two pairs of the original Tour 360s, had one pair of the 360 2.0s and currently have a pair of 3.0s. These can probably be had for a little more than $100 on a certain internet auction site that rhymes with Flea Bay. I’ve tried them on and they seem good. Plus they look pretty sharp, like an updated version of classic saddles. Cons: Over the past four years or so, I’ve had five pair of adidas golf shoes. It might be time to try something else. Also, I don’t love the stitching line that runs from the laces to the toe across the top of the shoe. And the safe choice isn’t always the best choice. Pros: These are one of hottest shoes out there on the market right now. 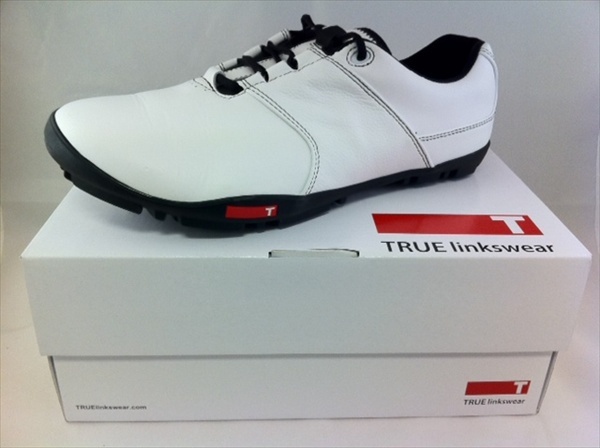 TRUE took the PGA show by storm this winter. Reviews I’ve heard — including from people I know who own them — have been very positive. These are supposed to be very, very comfortable. Comfort, after all, is one of my biggest wants. Cons: I have two significant concerns. First, I would like to be able to try these on before buying to see how they fit, but I haven’t found anywhere in the Twin Cities that has them in stock. Second, I have some concerns about lack of arch support. Would that cause my plantar fasciitis to flare up and my feet to bark? I have some concerns there. Also, I’d like to see how these really look with shorts. Are they kind of goofy looking? Pros: Having heard good things about these, I made a concerted effort over the weekend to try these on. I have never owned a pair of Nike golf shoes as I seemed to have problems getting them to fit my feet. They were often either too tight or they would slip in the heel area — two options that were far from perfect. This shoe, however, was much better. It’s light. It fit my foot well. It seemed pretty good. In almost all areas, Nike has much improved golf products over a few years ago. I like the One Tour ball. I played a set of Nike irons for much of last season. Their other club offerings are better. I used only like their clothes and said I would never hit their clubs, but now I have a much more open mind. I like the look of the shoes on the right and left of the picture above as they have the look of a modern classic. Cons: I am somewhat of a golf snob. I can’t lie about that. I see guys with Nike golf shoes and I don’t always take them seriously. I think they might be guys who buy bad clubs and play three times a summer. Yes, I know that is snobby. Sorry. The other con is kind of the unknown. Since I’ve never worn Nike golf shoes (though I have had success with some of their running shoes and like their golf clothes), I don’t know how they will hold up. Are they durable, etc.? That isn’t a con as much as an unknown. So do you like any of these? Had any experience with any of these? Because if you read 1,000 words about golf shoes, I know you have an opinion. I don’t like the look of ANY of those shoes! Not that it matters. I owned two pairs of Nike shoes, years ago. Very comfortable. Both fell apart WAY too quickly. Never again. I have two pairs of the modern DryJoys – with the wide arrows/saddles in the middle of the shoe that came in a variety of colors. Perhaps there are only a couple models left – I think they look in shorts and are comfortable, as well. I do think it’s tough to beat the look of Adidas with shorts, though. I would also look at the Ecco’s – maybe not the Freddie Cool Street spikeless ones, though they are intriguing as well. FWIW, I am firmly anti-Nike and golf. Has little to do with TW – just doesn’t seem right. I am firmly anti-Nike, period. Has little to do with those shoes I owned — but they didn’t help! Dan, you’ve made that very clear in the past. I don’t have strong feelings one way or another. But if you care what I think of those shoes (and you DID ask! ): I’m even more opposed to intrusive logs as I am to Nike. (I don’t think I’ve made THAT very clear in the past!) Why should a person spend the day on the golf course advertising for Nike, or for Adidas? There’s no DIGNITY, no RESTRAINT, in those logos. Or so I think, FWIW. I’m just really tired of seeing that Swoosh and those Stripes everywhere. Advantage: Footjoys. Advantage: Trues. I think the True linkswears are a great looking shoe. They get my vote.